Powers/Abilities: Able to transform into a superstrong incarnation using the Sword of Power given to him by the Sorceress. He draws the weapon and invokes the magic using the phrase "By the Power of Grayskull. I have the Power." He can also transform his friend Cringer into his steed Battlecat. History: Centuries ago the planet Eternia was threatened by the double threat of Hordak and the Snake-men, both of whom wished to dominate the realm. Opposing them was the warrior-king of the planet, Grayskull, a giant of a man with superhuman strength. Using powerful magic, he managed to banish Hordak and his forces from the void, but at the cost of his own life. Dying, his life force transferred to his sword, which was then taken into the care of the first Sorceress of Grayskull. Many years later the current king of Eternia, Randor, faced his ambitious brother Keldor in a struggle for the throne. Defeated and horribly wounded, Keldor fled; dying, he had a vision of Hordak, now a disembodied spirit, who offered him assistance at a price. Keldor accepted, and was bathed in arcane energies, emerging transformed into the skull-headed Skeletor, a being of pure evil. Sensing Hordak's intrusion into Eternia's dimension, the current Sorceress of Grayskull summoned Prince Adam, Randor's son, to Castle Grayskull. She gave the young warrior the sword she and her predecessors had guarded for so long. By calling on the Power of Grayskull, Adam could transform himself into He-Man, an avatar of the ancient Eternian ruler, growing massively in stature and strength; he could also transform his companion feline Cringer into Grayskull's massive ally/steed Battlecat. 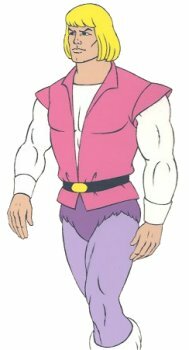 Comments: Voiced by John Erwin in the original series, Gary Chalk in The New Adventures of He-Man and Cam Clarke in the 2002 version of the cartoon. 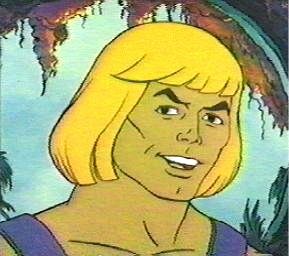 He-Man was created as the head of a line of action figures produced by Mattel. I've heard rumour that they actually planned a Conan series, in conjunction with the Arnold Schwarzenneger movies, but swiftly realised that the films would be unsuitable for children, and so modified the molds they had already created to get their own original character. However I've no confirmation to the truth of this story, so I list it more as an interesting "urban legend" than as fact. Regardless of the origins of the line, the figures sold extremely well, and Mattel turned to Filmation, who had animated some of the early TV adverts, and asked them to produce a cartoon to further promote the show. Thus was born He-Man and the Masters of the Universe. While Mattel apparently viewed the cartoon merely as a toy showcase, several up and coming writers working for Filmation saw it as a chance to showcase their writing talents, and the cartoon proved to have stronger storylines than people had expected. The original order of sixty-five episodes was doubled to one hundred and thirty, plus two specials, and a spin of show featuring He-Man's sister, She-Ra. 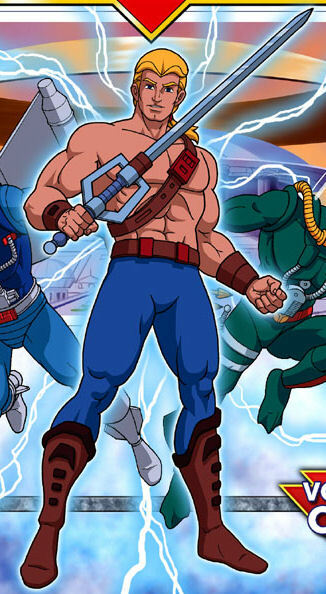 Even after the show ended, it's popularity amongst the original viewers didn't wane much, and twenty or so years later, as those children gained increased spending power, He-Man returned, with new episodes on TV, a new comic from Image, and a revamped toy line. Powers/Abilities: Immense size and strength, extremely agile. Possesses deadly claws and fangs. 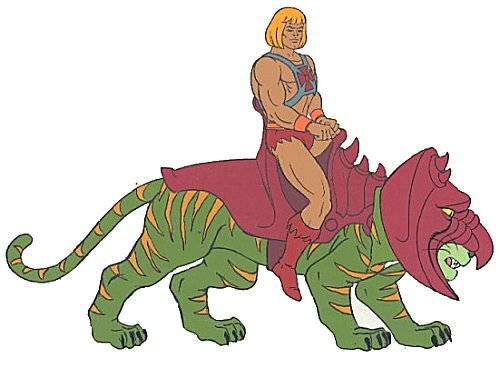 History: Cringer was the meek and somewhat cowardly feline companion of Prince Adam of Eternia; however when Adam was transformed into He-Man, he could likewise transform Cringer, channeling the energies of the ancient King Grayskull's Battle Cat through his feline companion. Comments: Voiced by Alan Oppenheimer in the original series.